This entry was posted in Uncategorized and tagged Albert, Alfred E. Neuman, Charlie Brown, Churchy, Mad Magazine, Mam'selle Hepzibah, Pogo, Walt Kelly. Bookmark the permalink. Always loathed Peanuts, never cared for Pogo, sorry to say, used to buy Mad Mag on the sly. Wish I had a dad who’d grunt with pleasure at such things. Lucky you. He doesn’t grunt, he guffaws; very different. 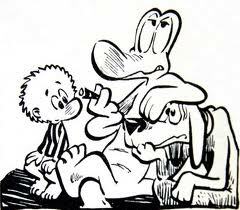 My father would always read me the comics (from the LI Press and later Newsday) Pogo was definitely one of them…the funny pages just aren’t the same anymore! That’s why you’re smarter than me. I was reading baser comics. 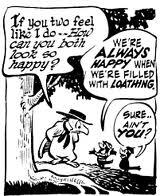 I always found Walt Kelly’s lettering too hard to read when I was a kid, though I now consider it one of the more brilliant aspects of the comic. His work is truly masterful, and really demonstrates what comics can do that is unmatched by prose, TV or other media. What a surprise to learn that there is another Pogo aficianado in the extended family. I’d always thought that Bram was the only true believer. Cheers.